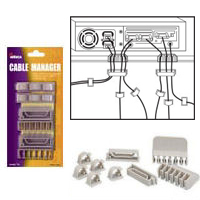 This cable manager helps to minimize clutter on your desk and behind your computer. Labels on the cable managers provide clear identification for each cable. Organize up to 12 Cables. 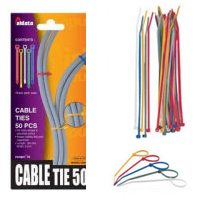 These Nylon cable ties securely hold your cables together, reducing clutter. Each tie is 16.0 cm long and 0.3 cm wide. The Under Desk Spine Cable Management by Aidata eliminates unsightly cable clutter by enclosing all cables within a single flexible housing. The articulated spinal design accommodates standard fixed-height desks up to 33" in height. The modular design accommodates easy shortening or lengthening for specific needs. The Under Desk Spine Cable Management secures to the desk using a sturdy clamp and has a weighted base to keep the bottom in place at floor level. Cables are gathered together and routed through the flexible "spine". This ensures that cables are neatly clustered and protected from snagging or potential pinch damage. Cables can also be added or removed with ease at any time, without any disassembly of the modules. If you are looking for a similar concept for a Height Adjustable Sit-Stand Desk the SPICA Cable Management System offers the same functions but for desk heights up to 51". 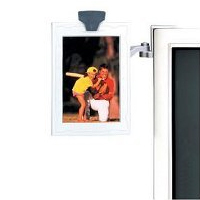 This economical photo / copy holder attaches to either side of your monitor. 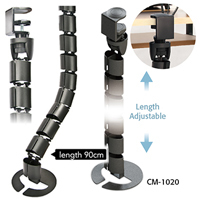 The swivel joint allows you to adjust the orientation (portrait or landscape) and position of the clip/frame. Frames photos up to 4" x 6". The Deluxe Mobile CPU Stand elevates the CPU up to 5" (12 cm) off the floor, protecting the air intake from floor dust, and positions the CD tray and disk slots at a more comfortable height. The width is adjustable using easy-grip plastic knobs, and will Accommodate CPUs of 6.5" (16.5 cm) to 9.5" (24 cm) in width. 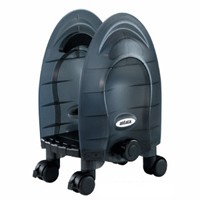 It is equipped with 4 swivel casters for easy movement. The nonskid foam pads and heavy-duty molded plastic construction ensure that your CPU is protected from damage. The Deluxe Mobile CPU Stand is available in graphite or platinum colours. The McCarty's SacroEase Neck Ease is designed to improve or enhance existing neck supports on chairs or vehicle seats, acting somewhat like a "lumbar support for the neck". Many office chairs and vehicle seats offer a limited or insufficient range of adjustment on their headrests. As a result these headrests are often positioned too far back and are unable to provide sufficient support for the head and neck while an individual is actually engaged in their work or driving. The Neck Ease straps around the existing headrest or headrest bracket and positions the neck pad in front of the existing headrest support. 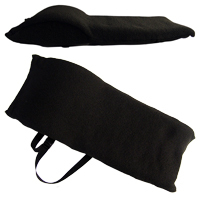 This brings the Neck Ease into contact with the back of the neck or head while a user is actively working or driving, enabling them to relax their neck muscles while letting the softly cushioned Neck Ease provide support. The lower portion of the Neck Ease ensures a smooth transition from the backrest to the upper neck support portion. The Neck Ease is made with poly foam and Comfort Memory Foam, and is covered with a soft, removable, and washable covering. 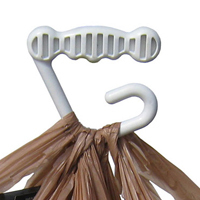 The Bag-Mate from Carliss Industries is a comfortable and convenient handle for carrying grocery bags, whether plastic or cloth. It spreads the load over a larger area on the hand, and reduces the sharp pressure point which bags usually cause on the hands. The Bag-Mate allows all the muscles in the hand to carry and maintain control of the load for a longer period with less fatigue. It is lightweight and compact but can carry loads up to 70 lbs (about 6 to 12 bags with each Bag-Mate).